I have had my Nook eBook Reader for a few month, and I am really hooked – so hooked that it bothers me when I have to resort to “paper solutions” for anything. It is so nice to be able to carry the Nook around with all kinds of books, news feeds (ala Calibre), PDFs and more. Four notable issues I’ve had seem like they could be turned into solutions by someone who has the time and resources to do so (i.e. I’d like to be a user/consumer of these services and not the developer). Agendas, schedules, handouts for meetings, conferences, and events – still largely paper even though most people have a device (phone, laptop, eReader) with them. A few weeks ago I attended the Maker Faire Detroit at the Henry Ford Museum – great time. When you get to an event like this there are hundreds of different exhibits to go to across a few football fields of area and through multiple buildings. There are also scheduled events (e.g. the Diet Coke / Mentos performance, PowerWheel Races, Storm Chasers speaker / movie, etc.) that you don’t want to miss. Almost any conference or event will have materials like that include documentation, details, maps, and more. How can this type of content be captured for use on eReaders and distributed easily at the event? Or, whenever I run a meeting or attend a meeting there are usually agendas and handouts for everyone. This is true for professional presentations or even regular class meetings at a college or school. How could these materials be created by the organizers or teachers and sent to the devices of those in attendance? There are really two issues here: 1) content generation / authoring, and 2) distribution. The first is hopefully the easiest. This content is typically already created and available either as a Word document, web site, or app. Unfortunately Word (and other word processors) are primarily designed to print to paper, or “print” to a file (typically PDF or HTML) that will be printed or viewed later. The PDF formats of many of the handouts/schedules/etc. are often available and can be sent to a reader like the Nook. Unfortunately many of the readers are not “letter paper sized” – in fact some of the most popular readers have about a 6-7” diagonal screen size as opposed to the 14” diagonal of letter paper. This either means that the reader must scale and zoom the content (annoying) or it tries to auto scale and flow the text (works sporadically and not well with images). So what we need is for Word to have a “Save As … eBook” feature that would enable the text and images to be saved correctly as an eBook file. It would be cool if this would include the table of contents, links, and images in the correct format. Also, much of this kind of content is already available on the web – sometimes in far more detail than the printed equivalents (and perhaps more up-to-date). Web pages can support a different set of style sheets and formatting for when a page is printed. Why not have an equivalent for “Save As … eBook” for web browsers. You could save all or part of a web site down to an eBook file that could be used and viewed “offline” for this purpose. Unfortunately for the industry, Amazon adopted a proprietary format for the popular Kindle eReader – the “.mobi” file. Nearly all of the other eReaders support the industry standard ePub format. Because of this, there is really no single file format that would work for everyone. Until this is fixed, or it is easy for a Kindle to convert and read an ePub, there would have to be at least two different eBook formats that would need to be saved. There is an updated version of ePub (3.0 http://idpf.org/epub/30 ) that is out as a public draft already. Hopefully the awesome new features (HTML5, CSS, Media (Audio/Video), SVG, and more) will tempt Amazon to supporting this on the Kindle and bring a standard to all devices (like MP3 did for digital music players). Assuming that the organizers/presenters/teachers can now create eBooks easily, how do they get distributed to the devices? This is a little trickier, but not that bad. For the scenario where one person wants to share a single document with another person, this functionality already exists in the Nook’s “Lend Me” for specific books. 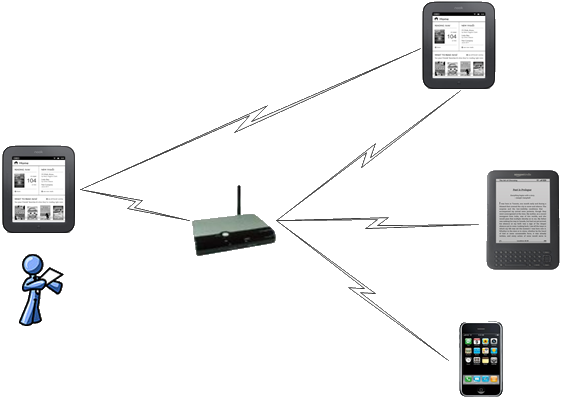 But this is still a device-specific function between two eReaders from the same company. 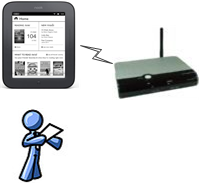 What needs to be developed is a standard and devices for wirelessly serving up books. What I am thinking is something along the lines of the “MiFi” devices (http://en.wikipedia.org/wiki/MiFi) that enable WiFi internet connectivity over a wireless carrier. If a presenter/speaker/teacher could have one of these devices, they could upload their files to it and then they could be made available to any eReader out there (in fact, a semi-intelligent device could even translate the uploaded file into other formats as they are uploaded or on the fly). Then, if I am a presenter I can send my files to the device, let people know they can connect to it, and then anyone who has a mobile device or eReader can get all the files they need. Alternately there could be an online service that you could access that could contain files for download (ala DropBox or even YouTube) but for eBooks. It could work much like Twitter hashtags – give the audience a particular tag (e.g. #myconference2012) and they could pull up a list of eBook documents that could be added directly to their device. That would be so nice. The clear issues with this type of solution would be that you may want to secure who can gain access to your documents, and you may want to be able to charge for them (and the eReader makers might want to find a way to make their money too). But to do “open to all and free” it shouldn’t be that big of a deal.